This burfi is the easiest sweet dish for a sister to make for her brother. Firstly, you will have to powder the cashews in a grinder. After grinding kaju or cashews, keep it aside. In a pan, heat water and add sugar to it. Make the sugar syrup with two-thread consistency. After it is done, add cashew powder to it. Also add small pieces of pistachios to it. Mix well and remove it from flame when the mixture starts to thicken. Spread this mixture immediately onto a greased plate. Cover the mixture with silver foil. Allow it cool for sometime. Then cut the diamond shape of burfi and serve it. 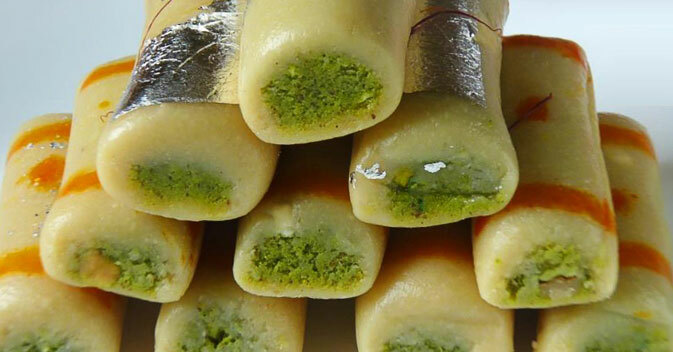 Sendrakhi.com offers you easy to make process of kaju and pista burfi. You can know more about Rakhi dishes and Rakhi sweets at the website. So, keep browsing!